Do you need custom color and special effects on your vehicle? If you want to create a unique work of art out of your custom vehicle then consider custom colors. Custom color and special effects let your car stand out from the rest. SHOP & SAVE WITH US! 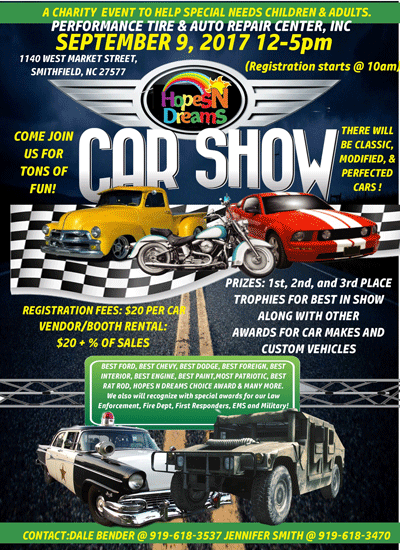 Performance Tire & Auto Repair Center Inc. 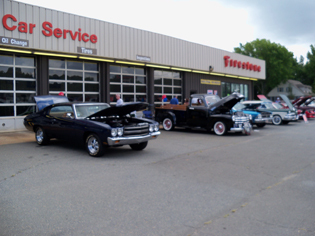 Performance Tire & Auto Repair Center Inc. Offers Auto Repair Services You Can Count On! 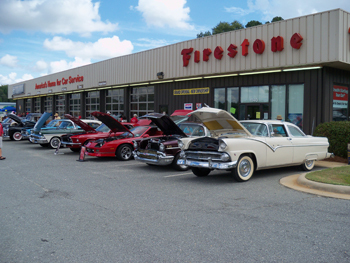 Since 1972, Performance Tire & Auto Repair Center Inc. has provided motorists in the Smithfield, NC 27577 area with comprehensive auto repair services that include 4x4 Services, Alignment, Brakes, Car & Truck Care, Custom Work, Domestic Cars & Trucks, Electrical Services, Electronic Services, Engine & Transmission, Engine Maintenance, Fleet Brakes, Fleet Drive Train, Fleet Electrical, Fleet Engine Work, Fleet Front End Services, Fleet General Services, Fleet Suspension Work, Fleet Trailer Work, General Services, Heating and Cooling Services, Import Cars & Trucks, Inspections and Emissions, Miscellaneous Services, Quick Lube Services, Tires, Towing, Transmission Services, Undercar and Undercar Services. Our goal is to offer the best services available at affordable prices to get you back on the road in no time. For a high-performing vehicle, trust Performance Tire & Auto Repair Center Inc. with your car, truck, or van. To learn more about the services we offer, please contact us by phone at 919-934-2694 or send us an email. We also invite you to learn more about our dedication to you, our valued customer. They do a very thorough check of my car at each oil change to make sure there isnt any issues that I should be concerned about. It does take a little longer to check it over instead of just changing the oil and filter, but my peace of mind in knowing whats going on with my car is worth a few more minutes of my day. If there is a "list" of things my car needs they will let me know if any are safety related or if there maintenance related. I would rather know whats wrong rather than drive around thinking everything is fine when its not. Love the shop and the people. Highly recommend! We brought our car here as a referral from another customer who had a good experience. The staff was excellent and went above and beyond to make sure the issue with our car was corrected. They did give us a list of other things that needed to be corrected with our car, which we found was very helpful. We were able to plan what repairs were needed and when to get them done. Never once did they try to push or sell us services. We are thankful for honest mechanics. Helped me out tremendously when everyone else was closed for a holiday weekend! Really great customer service and super fast to get me back on the road! Scott, Dave and Jason are the best! Highly recommend! Thank you!